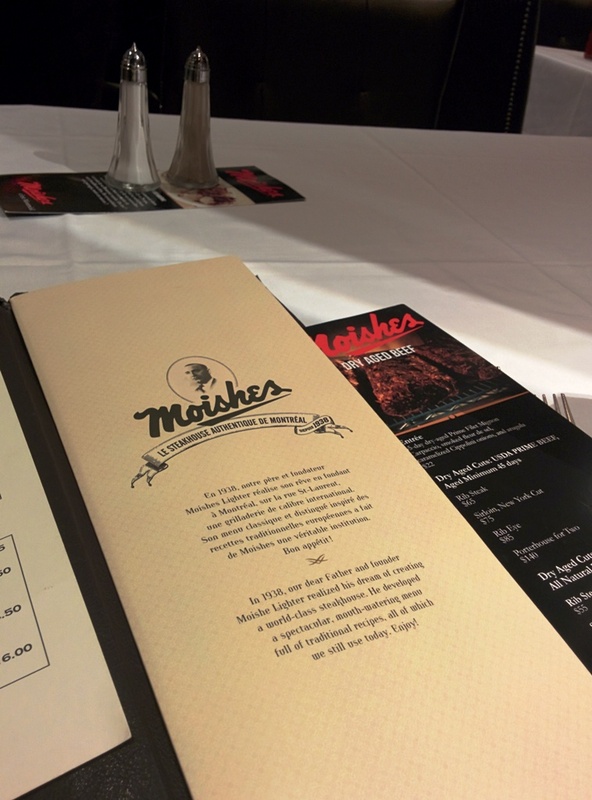 I was in montreal for 3 days and had a list of places to eat and surprisingly moisshes wasn’t on it; I heard about it there after I read an article where it was named as the 6th best steak in the world. 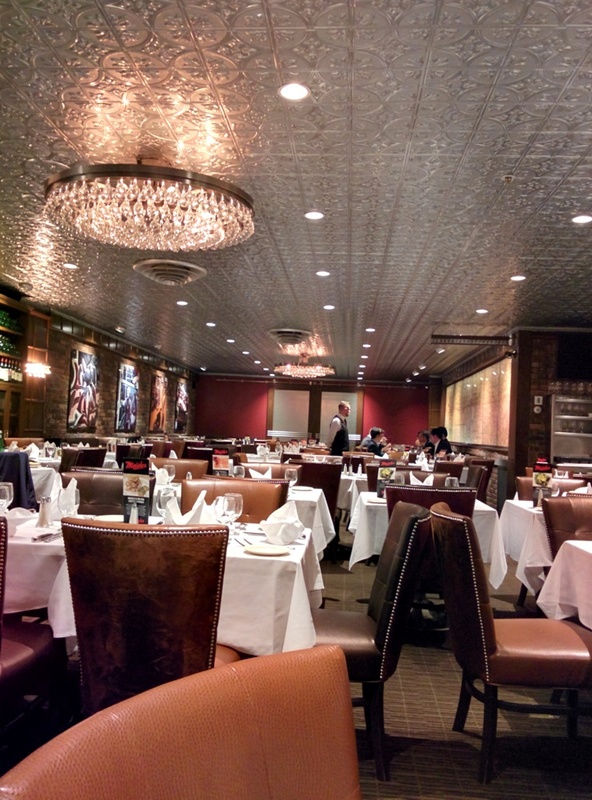 I walked in and it was a great atmosphere, a truly grand feeling as you entered the dining room. I sat and I perused the menu, settling on their USDA prime sirloin, a proper 45 day dry aged NYC cut which I ordered med rare. 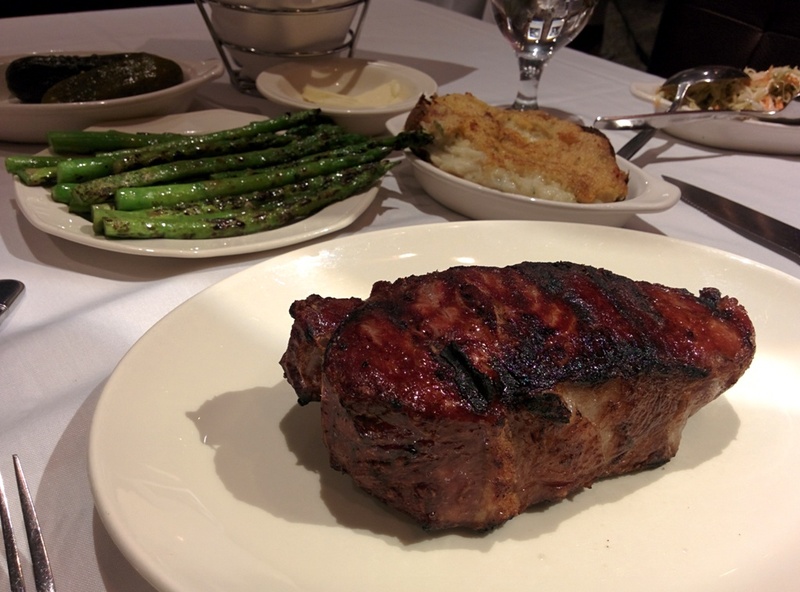 I also ordered two sides, their famed Montecarlo potato and the grilled asparagus. 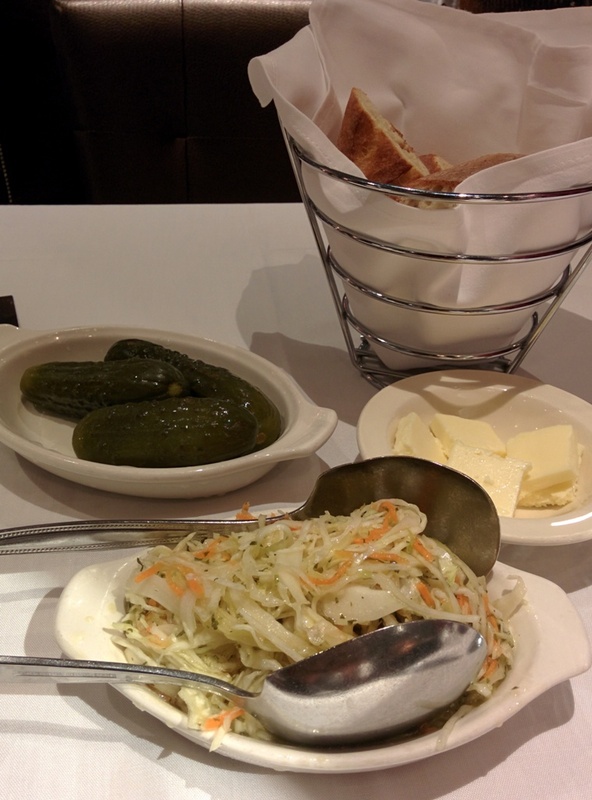 The meal also started with a couple dill pickles and a sweet, sour, altogether delicious coleslaw. The sides and steak all hit the table at once and I started to do my thing, pictures and pictures until I had the right angle then I got straight into it. The steak was charred something brutal, a hefty blackening and a great aroma but it was blue inside. It was a minor drawback for such a large piece of meat, I mean look at the thing. I sent it back to get cooked a tad more while I got into the sides. The Grilled asparagus was crisp, charred, oiled and salted well, a classic and well executed side. The montecarlo potato was something I’d never had before and it was divine, the baked potato hulled out then mashed with bacon, chives, butter and what I want to say was sour cream, it’s then re-stuffed and grilled to give to top I nice crispness. I have no complaints about this, if it was on the menu everywhere I would order it everywhere. The steak came out again and still didn’t reach that overall medium rare but I made do with the rare. A true Chicago style (super charred outside but rare inside); the flavour was amazing, the salt, char, smokiness from a proper wood fire grill, all topped off by the quality of the USDA prime beef. 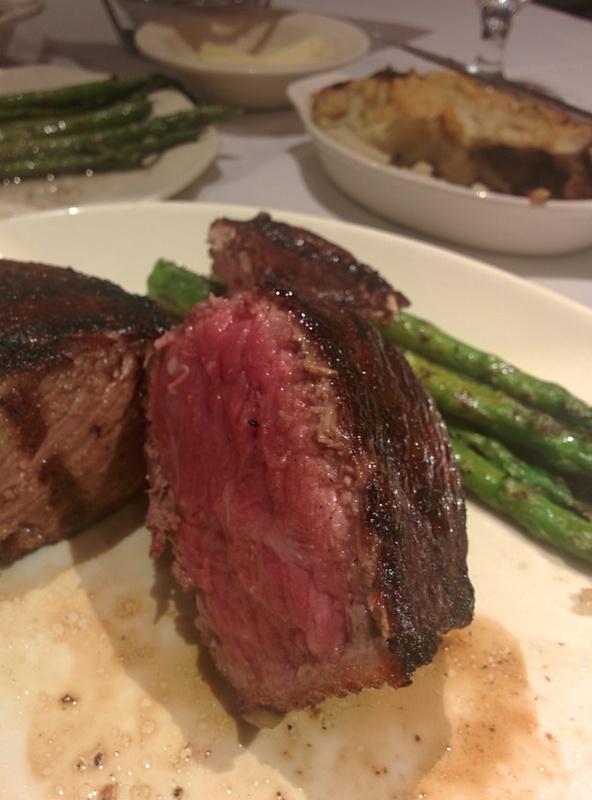 The tenderness was great but it was still a sirloin and had than nice bite to it. Overall a great meal and a great steak, but sixth the world, I must know how they judge that. 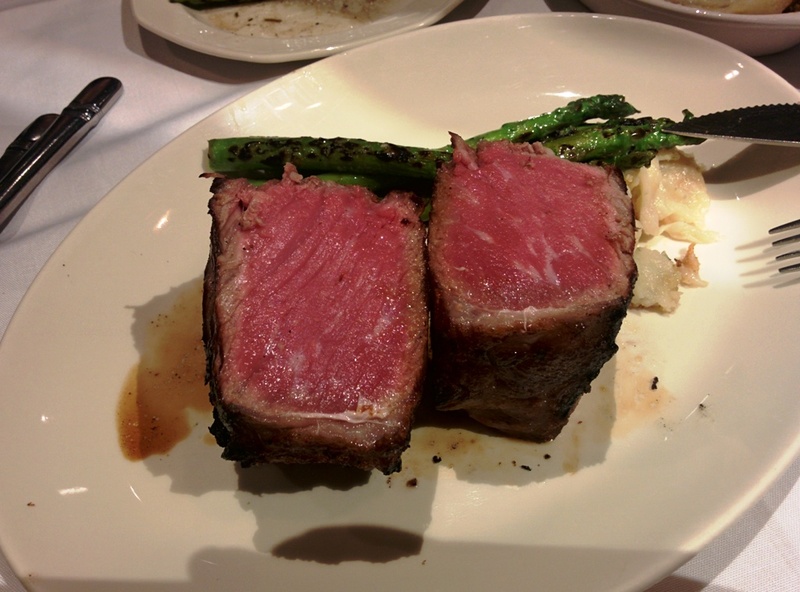 Posted on September 5, 2015 September 24, 2015 by AdrielPosted in Canada, Montreal, SteakTagged montreal, Porterhouse, Sirloin, Steaks, USDA Prime.